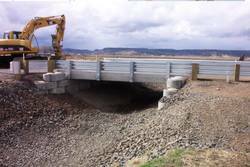 (WASHINGTON CO.) - Louisville Paving Company is charged with removing and replacing the 3-span State Road 60 bridge spanning Persimmon Run, located west of State Road 111, just west of Broom Hill Road in Washington County. The company will install a 14 x 9-foot concrete box culvert measuring 72 feet in width at a tributary to Muddy Fork Creek, located east of Borden. The contractor plans to begin work to replace the box culvert in mid-to late April. Two-way traffic on State Road 60 will be shifted to lane and shoulder areas during installation. This operation should be completed within 60 days. Replacement of State Road 60's 85-foot long bridge over Persimmon Run is expected to require 120 days for construction. Please use caution when traveling through this area and allow for a little extra travel time.